Whether you choose to attend mediation or the court has ordered it, as is increasingly common, a divorce mediation list is essential. Divorce is stressful, and mediation can lower your anxiety levels enormously. It's best to be well-prepared for mediation for the best outcome possible. A good checklist will help ensure that all concerns are addressed. Create your list as far in advance of your scheduled mediation as possible, and learn as much as you can about how divorce mediation works. You will find that your list evolves over time and that priorities shift after you begin the process of creating it. You may also need time to gather any documentation for items on your list. 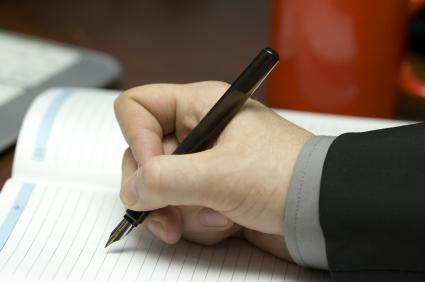 Begin by brainstorming and writing down issues that need to be covered in your mediation session. Ask a friend or relative to help, but keep your children from being unnecessarily exposed to the process as it can only be anxiety-provoking for them. First, write down every issue that comes to mind, even if you are unsure that you want to address it in mediation. After you have brainstormed, organize your items into groups or themes. Now it's time to prioritize your concerns. If you have children, they will likely be at the top of your list, but you will also need to prioritize the issues regarding your children. For example, are you more worried about who your children will spend their next birthdays with or about whether your ex-spouse will agree to pick them up from school? After you have a basic, prioritized list, it's a good idea to transfer handwritten notes to a document on your computer with word processing or spreadsheet software if you haven't already done so. This will allow you to easily list subjects in order of priority and re-organize if necessary. It will also be easier to make copies later. Review your preliminary list: Are there items that can be crossed off, or items you haven't added because you are afraid to discuss them with your spouse? Remember that mediation is no time to be petty, but it's the best time to discuss the things that you feel uncomfortable talking to your spouse about. Now that your list is outlined and prioritized, it's time to add notes for yourself. Save your list on your computer where you will easily find it again, then use this list to create a more detailed reference sheet to use during the mediation appointment. Add concise notes under each item to remind yourself about any documentation or details that will support your points. It's important that the mediator understands your views are not frivolous, but based on facts, especially if the mediator will be providing a statement to the judge in your divorce case. Knowing that you have supporting documentation may also encourage your spouse to cooperate with you. If you know in advance what issues your spouse will bring to the table, you can plan to bring your entire list to the first mediation session. If you are concerned that there will be surprises during mediation, bring at least two lists to the first meeting; a general list of topics to share at the beginning of the meeting, and one or more detailed lists that you can refer to as the need arises. There may be more than one mediation session, and it could be unwise to tip your entire hand at the outset if your spouse is not inclined to cooperate with you. While you don't want your divorce mediation list to make you appear petty, you also don't want to leave any bargaining chips out of the process. If you know that your spouse may have demands that you do not mind agreeing with, you can appear to waiver on some of those issues until your spouse agrees to work with you on your concerns. Be careful when planning your list strategies. No matter how unreasonable your spouse may be, most professional divorce mediators have extensive experience with manipulative clients, and being disingenuous can quickly backfire on you. Remember that whether or not you have an attorney, it's always a good idea to consult with one before mediation and discuss your list of issues. You are wise to plan for mediation by developing a thoughtful list of your concerns in advance. Have confidence in your ability to resolve your differences with your soon-to-be ex-spouse, and approach your session with a positive mindset. When writing your list, keep in mind what your ultimate goal is and what it should be: To negotiate an agreement that is in everyone's best interest to the greatest extent possible. Give this your best effort so that if nothing else, you can look at yourself in the mirror each day honestly knowing that you did all that you could.